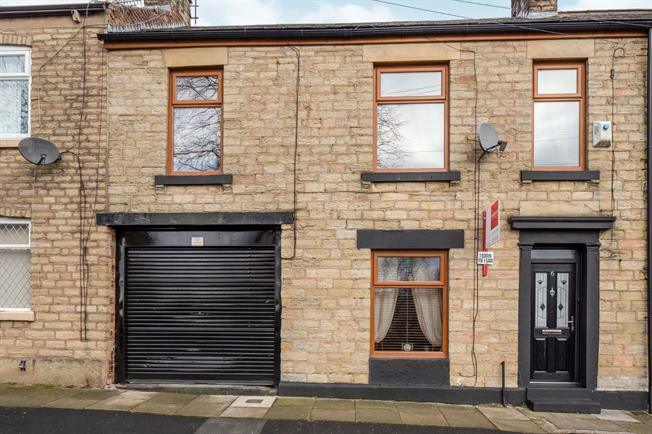 4 Bedroom Terraced House For Sale in Stalybridge for Asking Price £200,000. An internal viewing is absolutely essential to appreciate both the quality of the internal finish and the space on offer in this mid terraced property. The property consists of a living room, modern kitchen diner and additional utility room to the ground floor plus an integral garage. Upstairs there are three bedrooms and a stunning family bathroom with roll top bath and separate double shower cubicle. The loft has been converted recently and now provides a fourth bedroom and additional shower room. On street parking, gas central heated and fully double glazed. Viewing by appointment only. Double glazed uPVC front door with carpeted flooring and a ceiling light. Double glazed uPVC window facing the front. Radiator, laminate flooring and ceiling light. Double glazed uPVC window facing the rear with a radiator, laminate flooring, part tiled walls, under stair storage space and ceiling light. Fitted wall and base units with complementary roll top work surfaces, one and a half bowl sink with drainer, integrated electric double oven, gas hob and overhead extractor. Space for dishwasher and American style fridge/freezer with integrated Whirlpool cappuccino maker. Double glazed uPVC back door opening onto the rear garden with a double glazed uPVC window facing the rear. Radiator, laminate flooring, part tiled walls and ceiling light. Roll top work surfaces with fitted wall and base units plus space for washing machine and dryer. Carpeted flooring, under stair storage and ceiling spotlights. Double glazed uPVC window facing the rear. Radiator, carpeted flooring, fitted wardrobes and spotlights. Two double glazed uPVC windows facing the front. Radiator, laminate flooring and ceiling light. Double glazed uPVC window facing the front. Radiator, carpeted flooring and ceiling light. Double glazed uPVC window with frosted glass facing the rear. Heated towel rail, laminate flooring, tiled walls, storage cupboard and spotlights. Low level WC, roll top bath, double shower enclosure with thermostatic shower and pedestal sink. Ceiling spotlights and carpeted flooring. Double glazed uPVC window facing the rear. Radiator, laminate flooring, spotlights and eaves storage space. Double glazed uPVC window facing the rear. Heated towel rail, laminate flooring, spotlights. Low level WC, double enclosure shower, pedestal sink. Paved garden with decked area and additional storage space for bins with access into the garage at the rear.